Social media is everywhere. Everyone has an account on Facebook, Twitter, and/or Instagram that they use on a daily basis. These avenues not only keep us connected with others, but they also help us find people and places in an instant. And let’s face it, instant gratification is now the way of the world. Let’s narrow this social media frenzy down to just one platform; Instagram. Instagram has gained millions on followers in the last couple of years and it is turning into the platform of choice for many. Why? We think you will agree that pictures and videos are way more interesting than reading a post. Plus, with cell phones seemingly attached to everyone’s hip these days, it’s quicker to share a picture or video than to actually write a post for your followers to read. Now, let’s even narrow it a little bit more to focus solely on Instagram use for restaurants. Do you have an Instagram account for your restaurant? If so, are you using it in such a way that you are creating a buzz or traffic into your establishment? Whether you’re just starting out or have been using Instagram for some time now, let us share some tips we learned from Katrina Padron, founder of Padron Social Marketing, at the National Restaurant Association trade show. These tips are great ways to fine tune your account and make your restaurant stand out. Best practices suggest that restaurants commit to posting one picture every day. In the chaos called life, we know that can pose some difficulty unless you have a designated person to do the work. If posting every day is not possible, try to at least post five times a week. To help you save time with all of these posts, you might want to consider a scheduling tool to plan out your posts. One such tool is an app called latergramme. With this app, you can sit down once a week and plan out which pictures or videos to post and when you want to post them. The app even sends you a notification when your picture or video is scheduled to post with instructions to follow on how to go live with your content. The timing of your post is a big deal. In order to figure out what the best times are to post on Instagram, Katrina recommended checking out a great website called iconosquare.com. Iconosquare will link to your Instagram account and show you analytics as to when your account performs the best. It will also show you what photo filters work best by most likes or comments and which hashtags are performing the best, among other analytics. If you aren’t interested in hopping onto this website to get all of this great information, Katrina suggested posting between 7am and 8am in the morning or before bedtime. But, remember to always think about your target market before choosing these times. No one likes looking at a photo or video that is fuzzy or blurry. It just isn’t appealing and can even hurt your eyes. Always post clear, crisp quality photos and/or videos. Offering quality shots will make your posts more interesting, hold attention longer, give clarity to mobile users, and add to your business’s professional look. More importantly, it will make your posts more memorable. Mix it up. Of course you want to show everyone your delicious looking menu items, like a beautifully presented dinner plate, a decadent desert, or a fresh salad with toppings galore. But, consider sharing more of your business than just food. Add additional content to help your customers learn more about you and your business to create a connection between you and the customer. This connection is often what your customers are seeking. For example, include images of the front line, the kitchen, your walk in cooler, your employees hard at work, an image of your establishment from the outside, your outdoor dining space, etc. The ideas are endless. Use interesting camera angles. Try taking overhead pictures, low shots, or cross angled shots from the side. These angles are catchy and often pull the viewer in, keeping them engrossed for longer than the typical photo or video. Consider the Rule of Thirds when taking photos. The Rule of Thirds is a basic rule in the photography world that divides an image visually into a grid. This grid creates nine symmetrical squares with intersections where the grid lines cross. The points of crossing are the places where it is recommended to place the main content of the image that you are trying to take. It offers a more engaging photo as well as one that has a better balance. Build height with your photos. Adding height to your photos is a great way to pull customers in. Let’s say you are taking a picture of a burger. Add height to the burger by adding layers of lettuce, tomato, and cheese in between a puffy bun to make it taller. Even visualizing this, especially if you are a burger lover, creates a desire to eat one. The image of this tall scrumptious burger will entice your followers even more than the words. Use vibrant colors and backgrounds with props rather than a plain white color. Take photos of food items like fruits and vegetables that naturally have a colorful palette. In addition, add props into the background of your photos like table linens, silverware, ingredients used to make the item, or a wine bottle. Items like these will add a little something extra to your photo to create that visual appeal. Use a photo editing tool. These tools let you play with exposure, highlights, and cropping while offering filters that will brighten, soften, or change the color of your photo. After you choose a photo, Instagram does offer some editing within the app that you can use, but there are additional apps that offer more options with photo editing that are worth checking out. One such photo editing tool that Katrina uses is called Afterlight and it can be found in the app store for a small fee. There are so many other tools that you can purchase for free; it’s just a matter of downloading it and trying it to see which ones work best for you. When you post a picture or video on Instagram, you have the opportunity to make a comment with your post. You may think to yourself, “What am I going to say?” A great idea starter when this happens comes from a one page form called A Case of the Blahs, also found on the Padron Social Marketing website. It includes 50 prompts to get your mind moving so that you can post a comment that achieves likes and interaction with your customers. Katrina recommends that you offer a comment with each picture or video that you post as a way of interacting with your followers and customers. And, don’t forget to add the hashtag, our next topic to discuss. Hashtags are words or phrases preceded by the number or pound sign that offer a way to categorize content. This categorization makes it easier for people to search for information and join conversations on a certain topic. They have gained extreme popularity in the last few years on all social media platforms and you see them all over the internet. On Instagram, it is recommended for businesses to only post up to 3 hashtags per post and to use ones that are unique to your business. Consider hashtags that are important to your community and use them as a way to interact with other people and businesses in your area. Also, find hashtags that are popular on Instagram to add to your posts. You can find popular hashtags by clicking on the magnifying glass icon at the bottom of your Instagram app on your mobile device and search for whatever topic or image your photo/video offers. Hashtags are a new concept and can be hard to understand but when used correctly, can bring more attention to your posts. Instagram offers information just for businesses like how to get started, finding customers, sharing brand photos, using hashtags in addition to an Instagram for Business blog. Check out Instagram for Businesses online to gather information that will allow you to take full advantage of this platform for your bar or restaurant. Consider making the content on your business Instagram account different from the content on your other social media accounts. If the same content is on every feed, people will tune out. Use each platform for a different reason or to cater to different groups of customers. Instagram doesn’t just have to be all about photos and videos of food from your restaurant. 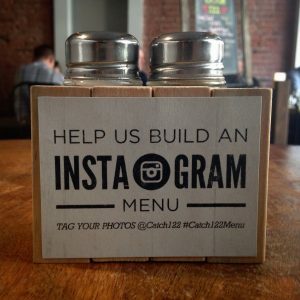 Aaron Allen & Associates, a global restaurant consulting company, offers a blog article called 10 Great Ways to Use Instagram for Restaurant Marketing. They suggest using it as a tool for contests, interactive menus, odd and interesting photo opportunities, behind the scenes looks, or community and culture awareness. For additional ideas, check out other restaurant’s Instagram accounts to spark your creativity. Instagram is a great tool for businesses, especially for restaurants looking for a way to market themselves in the social media world. When used correctly, it’s a popular avenue to tell your story and create a buzz that brings your customers in to enjoy your menu. Great ways to create a wonderful Instagram strategy for your restaurant. Thanks for sharing these awesome tips! Love the “Help Us Build An Instagram Menu” sign.